The Walking Dead – Rise of the Governor – Exclusive Audio | We Zombie! OK, Walking Dead fans, look alive! Have you ever wondered how the Governor came to be? How he got his power? How he came to enjoy and demand sick games like making dissidents and prisoners battle zombies in an arena? The Governor was voted “Villain of the Year” by Wizard magazine, and deservedly so. MacMillian is releasing a new audio version of the book “The Walking Dead: Rise of the Governor,” which will be released tomorrow, October 12th. 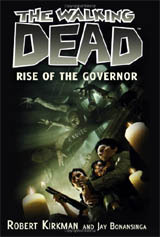 Authored by Robert Kirkman and Jay Bonansinga, the story is read by Fred Burmen, and chronicles the rise of the Governor – how he came to be the man he is, and what drove him to such extremes. Click on the image to the right or this link to hear an excerpt from the audio -book. I’ve received a copy of the audio book – stay tuned for a review of the audio-book version of this great story. This entry was posted in Books, Fresh, Movies/Music/Audio. Bookmark the permalink.